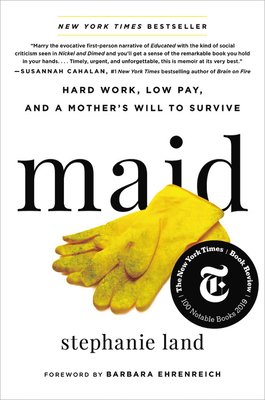 Maid: Hard Work, Low Pay, and a Mother's Will to Survive (Hardcover) | Fountain Bookstore, Inc.
Stephanie Land's intimate and intense new memoir showcases years spent as a single mother working on minimum wage while trying to put herself through school. Homeless with a baby daughter through circumstances not uncommon, we see her moving from apartment to apartment while constantly seeking employment, childcare, healthcare and government assistance. It is a riveting and eye-opening account of how difficult it is to manage through the endless red tape of social welfare let alone getting out of it. Land is a natural writer and brings forward a strong voice for the voiceless.